It’s been fun “watching” Steve Ballmer negotiate this week. First, in Brussels, he finally surrendered to Neelie Kroes, the EU’s competition commissioner, agreeing to comply with the EU’s ruling that Microsoft must allow open-source software developers access to interoperability information for its work-group servers, thus reducing the “Windows tax.” Then, popping up in Palo Alto and San Francisco, he triumphed over Google to gain the privilege of being the exclusive third-party “advertising platform partner” for social networking darling, Facebook. Microsoft sealed the deal with a $240 million equity stake. It says a lot about what our society values when the hottest news of the day is Facebook’s $15 billion valuation. With “nearly 50 million active users” who attract others at a rate of 200,000 per day, the $240 million investment is a small price to pay for the value to Microsoft of keeping Google from grabbing more of the social networking turf and giving Microsoft a much-needed platform to expand its reach for both ad revenues and for its applications and utilities (Xbox, Microsoft Live, and Bill and Steve’s newest hot button—responding to iPhone with unified communications). But you can also rationalize the 100x revenue multiple as the value of Facebook’s Customer Franchise (a term I defined in 2001 in my book, The Customer Revolution).1 You may remember the logic. The value of a company’s Customer Franchise is equal to its current Customer Capital + its Customer Momentum. I define a company’s Customer Capital as the sum of the value of all your existing customer relationships. In other words, it’s the lifetime value of your current customer relationships. This is more than the $150 million in revenues that Facebook currently earns from its 50 million members ($3 per member in annual advertising revenues). It’s the lifetime value of the revenues that can be expected from these members as long as they remain in relationship with Facebook, say 5 to 10 years. Microsoft is placing a bet that these existing members will remain active for a few years, using Facebook to strut their stuff and to connect with friends, family members, and with people they would never meet otherwise. Customer Momentum is your ability to attract and sustain new customers with low customer acquisition costs. It’s the lifetime value of the customers you can organically grow through referrals and word of mouth. The great thing about social networks is that customer referrals are built in. In my case, my kids have Facebook pages, so I want to see what they’re up to. You join, you are welcomed, your friends or family invite you to their circle, you expand your network, then others begin discovering you, and you gain a new circle of acquaintances. 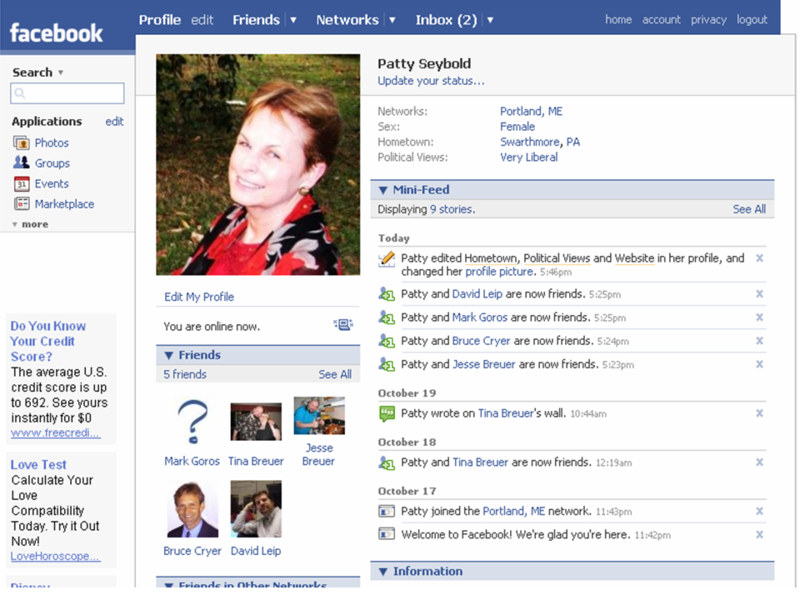 Today, Facebook’s customer momentum is 200,000 net new customers per day. Tomorrow, that momentum is likely to be higher, since social networking expands the pie exponentially (until it implodes and everyone moves onto the next hot social network). With Microsoft’s investment, Facebook will be able to beef up its infrastructure and expand internationally more aggressively, thus theoretically increasing its customer momentum. Why should businesses care about the economics of social networks and the advertising platform wars being waged by Microsoft, Google et al? First, we’d all love to tap into the social networking phenomenon to grow our respective businesses. Why not let your customers reach out to others like themselves to help you grow your business organically? Referral marketing and vibrant ecosystems are the secret sauce of any successful business. Vibrant online customer communities and networks that enable customers to strut their stuff, tell their friends, rate and comment on your products, and bring new products and partners into your ecosystem is the sometimes scary stuff that helps any business grow.